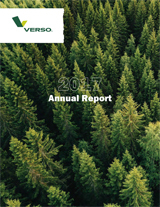 MIAMISBURG, Ohio, July 18, 2018 /PRNewswire/ -- Verso Corporation (NYSE: VRS), announced today that it plans to hold its 2018 Annual Meeting of Stockholders at 3 p.m. (EDT) on Monday, September 24, 2018, at the offices of Akin Gump Strauss Hauer & Feld LLP, in New York, New York, or such other location as may be selected by the company's President and Chief Executive Officer. The record date for the 2018 Annual Meeting will be August 13, 2018. Additional information relating to the annual meeting will be provided in Verso's proxy statement for the 2018 Annual Meeting. The anticipated director nominees are Alan J. Carr, Eugene I. Davis, Steven D. Scheiwe, Jay Shuster and Verso's Chief Executive Officer, B. Christopher DiSantis. Jerome L. Goldman, a member of the company's board of directors, has decided not to stand for reelection at the company's 2018 Annual Meeting. As previously announced on October 9, 2017, Robert M. Amen had decided not to stand for reelection to the board of directors at the 2018 Annual Meeting. In connection with Mr. Goldman's and Mr. Amen's respective departures and to eliminate the resulting vacancies, the board of directors, by resolution in accordance with the company's Amended and Restated Bylaws, has reduced its size from seven to five directors, effective upon the election of directors at the 2018 Annual Meeting. As a result, the number of directors who will stand for election at the 2018 Annual Meeting has been reduced from seven to five. Because the date of the 2018 Annual Meeting is more than 60 days after the one-year anniversary of Verso's 2017 annual meeting of stockholders, the deadline for the submission of stockholder proposals and director nominees for consideration at the 2018 Annual Meeting is extended. Proposals by stockholders and submissions by stockholders of director nominees for consideration at the 2018 Annual Meeting should be submitted in writing to Verso Corporation, Attention: Corporate Secretary, 8540 Gander Creek Drive, Miamisburg, Ohio 45342. Notice of all proposals and nominations by stockholders, whether or not intended for inclusion in the proxy statement for the 2018 Annual Meeting, to be timely, must be delivered to, or mailed and received by, Verso's Corporate Secretary on or before 5 p.m. (EDT) on July 28, 2018. Any stockholder proposal or director nomination delivered or received after 5 p.m. (EDT) on July 28, 2018 will be untimely and will not be properly brought before the 2018 Annual Meeting. Proposals by stockholders and submissions by stockholders of director nominees must also comply with the procedures set forth in Verso's Bylaws and, if intended for inclusion in the proxy statement, Rule 14a-8 under the Securities Exchange Act of 1934, as amended. In this press release, all statements that are not purely historical facts are forward-looking statements within the meaning of Section 27A of the Securities Act of 1933 and Section 21E of the Securities Exchange Act of 1934. Forward-looking statements may be identified by the words "believe," "expect," "anticipate," "project," "plan," "estimate," "intend," "potential" and other similar expressions. Forward-looking statements are based on currently available business, economic, financial, and other information and reflect management's current beliefs, expectations, and views with respect to future developments and their potential effects on Verso. Actual results could vary materially depending on risks and uncertainties that may affect Verso and its business. Verso's actual actions and results may differ materially from what is expressed or implied by these statements due to a variety of factors, including those risks and uncertainties listed under the caption "Risk Factors" in Verso's Form 10-K for the fiscal year ended December 31, 2017 and from time to time in Verso's other filings with the Securities and Exchange Commission. Verso assumes no obligation to update any forward-looking statement made in this press release to reflect subsequent events or circumstances or actual outcomes.